36 FLEX007 MAGAZINE I OCTOBER 2018 However, whenever possible, use cut-back coverlayers and bondplys to provide the high- est package reliability possible. Because of cut-back coverlayer, the edge at the flex-to- rigid transition area can have a slight radius to it. Any circuits or plated features in this area will struggle to image faithfully and will suffer yield loss. For the same reason, the edge of the drilled via needs to be kept back from that transition line. If the vias are drilled partially through coverlayer and bondply and partially through prepreg, they will not yield—which typically shows as plating defects and opens at electri- cal test. It is the edge of the drilled hole that is critical and not the finished via size. If you call out a 0.012" finished hole on your design, fab- ricators usually drill that at 0.006" larger than the finished via size to accommodate plating thicknesses. If you put the edge of the finished via on the edge of the keep-out area, the drill itself will be drilling within the keep-out area. It is wise to involve and consult your fab- ricator as to what their keep-out limitations are in the rigid-to-flex transition areas of the board, which can often vary by design. These are not absolute rules, just recommendations to get the best design with the highest yields and lowest overall cost possible. FLEX007 References 1. 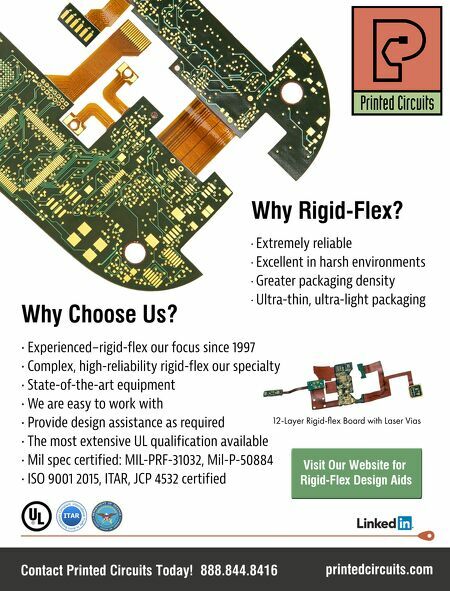 Printed Circuits' Valu Build Brochure. Bob Burns is national sales and marketing manager for Printed Circuits Inc. To read past columns or contact Burns, click here. Any circuits or plated features in this area will struggle to image faithfully and will suffer yield loss. In a recent survey, the I-Connect007 research team asked readers who work with flexible circuits to list their biggest problems related to flex design. 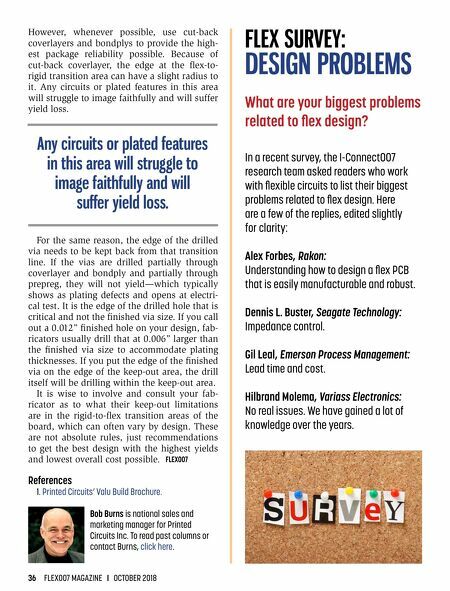 Here are a few of the replies, edited slightly for clarity: Alex Forbes, Rakon: Understanding how to design a flex PCB that is easily manufacturable and robust. Dennis L. Buster, Seagate Technology: Impedance control. Gil Leal, Emerson Process Management: Lead time and cost. Hilbrand Molema, Variass Electronics: No real issues. We have gained a lot of knowledge over the years. FLEX SURVEY: DESIGN PROBLEMS What are your biggest problems related to flex design?